Sometimes, a dental filling cannot adequately restore a tooth after the removal of decay, while reshaping the tooth and placing a dental crown would be unnecessary. In these cases, an inlay or onlay may offer an effective and lasting solution. Dr. Jon Marc Van Slate offers beautiful inlays and onlays at his Houston, TX, practice that are custom designed using advanced digital technology. To learn more about the benefits of inlays and onlays, reach out to our practice today. Inlays and onlays (also known as partial crowns) are intended to restore the appearance and strength of weakened teeth. An inlay covers the biting surfaces of a tooth, while an onlay extends beyond the pointed cusps and down its sides. Dr. Van Slate may recommend an inlay or onlay if you have a large dental filling that has failed and needs replacement. He may also recommend an inlay or onlay after removing a large amount of decay. 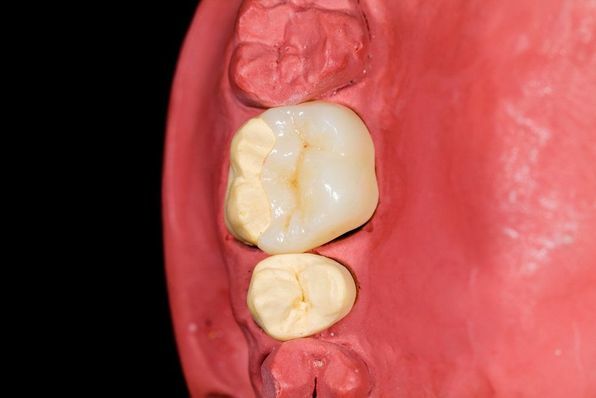 Both types of restorations can provide a greater level of strength to teeth than traditional dental fillings, and they do not require the removal of enamel that is necessary when placing a dental crown. When you visit our practice for a consultation, Dr. Van Slate will examine your tooth and review the benefits of inlays and onlays to determine if one of these restorations is right for you. Undergoing treatment with an inlay or onlay is a two-step process. During your first appointment, Dr. Van Slate will prepare your tooth by removing any existing filling material as well as all decayed portions. Next, we will use the innovative iTero® intraoral scanner to take detailed digital impressions of your tooth. When compared to the traditional process of taking impressions, the iTero® device creates a much more precise image that can be uploaded to a computer. We will also compare your smile against a shade guide to ensure that your inlay or onlay will blend flawlessly with your smile. Before you leave, we can provide a temporary restoration for you to wear between visits. Skilled technicians at the lab will design your inlay or onlay using highly lifelike and durable materials. The impressions of your tooth will be sent to an advanced dental laboratory. Skilled technicians at the lab will design your inlay or onlay using highly lifelike and durable materials. Once your inlay or onlay is ready, you will return to our practice for your final appointment. Dr. Van Slate will ensure your inlay or onlay fits properly before bonding it in place to instantly restore the strength and appearance of your tooth. With proper care, your inlay or onlay can last for several decades. Dr. Van Slate and our team are dedicated to providing patients with the highest standards of care. If you have a tooth with minor damage, an inlay or onlay may be able to provide an effective and conservative restorative solution. Get in touch with a member of our team today to schedule a personal consultation and learn more.